Pass built as Kenya Castle Harland & Wolff, Belfast for Union castle Line. 9676Nt 2866Dwt L22.66m. Six Parsons turbines. 14400shp. Yard No 1432. Acquired by Chandris America Lines SA 1967, renamed AMERIKANIS. Built as a passenger-cargo vessel under yard No 1432 by Harland & Wolf in Belfast for the Union Castle Line. 21 June 1951 launched under the name KENYA CASTLE. Tonnage 17,041 gross, 9,435 net, 10,252 dwt, dim. 175.72 x 22.66 x 12.27m., length bpp. 169.59m. Six Parsons turbines double reduction geared to two shafts, 14,4000 shp, speed 17.5 knots. Maiden voyage was a 14 day cruise from Southampton to the Canary Islands. Then placed in the service from London to the Cape via Suez, sailed on 4 April 1952 for her first voyage in this service from London. 1959 Her funnel lengthened and a dome top fitted. 1960 Passenger accommodation altered to 422 first class passengers. 22 April 1967 laid up at the River Blackwater, U.K. The British National Council considered her for an exhibition ship in 1966 but the idea came to noting. 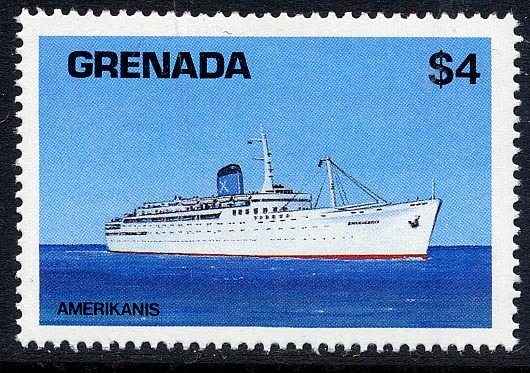 1967 Sold to National Hellenic American Lines S.A. (Chandris Line), Greece, renamed AMERIKANIS. 12 August 1967 she arrived at Piraeus and was extensively rebuilt, tonnage increased to 19,904 gross. Passenger accommodation for 100 first class and 800 tourist class. 08 August 1968 sailed from Piraeus for the first time for the new owners for New York via Messina-Naples-Lisbon and Halifax. Made three voyages from Piraeus New York before employed in short cruises from New York to the West Indies until the spring of 1969. Then she made three transatlantic voyages in the service between Piraeus and New York. 14 September 1969 made her last sailing from Piraeus and via Malta-Naples-Gibraltar-Halifax she reached New York. Then only used for 3, 4 and 7 days cruises in American waters and the Bahamas as a one class vessel with 920 passengers. 1970 Her tonnage altered in 16,485 grt, and used for cruises in American and European waters. 1980 Transferred to the Chandris America Line S.A., Monrovia. 1985 Transferred to the Fifth Transoceanic Shipping Co. Ltd., Panama. Tonnage changed to 12,792 grt, 6,906 net, 2.866 dwt. She was used in a service between New York and Bermuda till 1989, then cruising out from San Juan, Puerto Rica. 24 October1996 laid up at Eleusis Bay, Greece. There were plans to use her as a floating hotel in London, and renamed her again in KENYA CASTLE but she was sold in May 2001 to the scrapyard in Alang, India where she arrived on 4 June 2001..
Sources: Register of Merchant Ships completed in 1952. Merchant Fleets in Profile vol. 3 by Dancan Haws. Great Passengers ships of the World vol. 6. Marine news. North Atlantic Seaways.